For years I have been experimenting with my daily diet by avoiding certain foods. The usual suspects: gluten, dairy, processed foods, sugar, eggs, night shades, corn, chocolate. You know, anything that tastes good. Of course I could never avoid all of these foods at the same time - so it has been a very slooooow process. I'm glad for the journey - the ups and downs - the trial and errors. I certainly would not have the appreciation for certain snacks and meals if I had not gone thru many, many, many food cleanses. The toughest part of changing what or how I ate was staying focused on WHY I was making the change in the first place. Nowadays, when I eat an entire cheese ball in one sitting, I just know that I will have the next day to avoid cheese. Since I plan on living for a couple more decades - one night of eating cheese is just a blip in the road. I'm done with beating myself up - instead, I have fun finding new ways to eat and try new foods. I wasn't looking for a "diet" when I went to see a doctor in Laguna Beach last January 2017. In fact, I was confident that I had a pretty healthy regimen. Instead, I was searching for answers about my skin and overall health. The lab technician convinced me to buy a book. 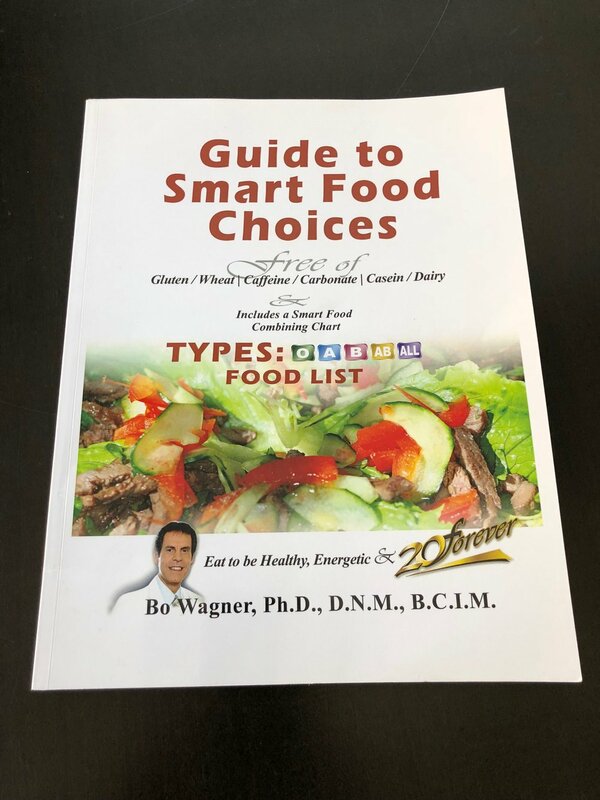 I'll never forget laughing on the plane ride home as I read thru the book - my top 10 favorite foods fell on the list of foods I'm NOT supposed to eat. There's nothing new about this "diet" it's been around for many years. What I love/hate about this way of eating is that the concept is simply to avoid the foods that don't match your blood type yet it offers plenty of foods that do match. In other words, its not all about what you avoid but you can choose foods that agree with your blood type. Beneficial foods. My type of foods. People have been asking me how I keep my weight in check. I just tell them about this book. It's very easy to read because you only have to read the section for your blood type (10 pages) and it's in chart form so cliff notes are not needed. Forewarning: although it's easy to read, it's challenging to implement. When my hub started buying protein bars from the local farmer's market, I didn't really notice the ingredients and to be honest, I didn't care. We live fast-paced lives and I agree that bars can bridge the gap between the multiple busy activities that we endure every day. But the reason I didn't care about the ingredients at first, is because I actually like food. I prefer to eat my three square meals and when I eat, I like to eat real food. A bar is not a meal to me. However, bars to my hub, is all he wants, likes and requires. Plus, I knew if someone was going to go thru the trouble to set up a stand at the farmer's market in order to sell protein bars the chances that the ingredients would be better than a Power Bar (which has a shelf life of infinity) was pretty high. One trip to the farmers market I saw the Ommie stand where my hub likes to get his bars so I stopped to buy some for him. I finally took the time to see what the ingredients were and I met the owner/founder. To know that this woman could come up with a delicious product and leave out the usual suspects I was trying to avoid, really impressed me. She then shared her mantra with me and I could feel her passion. I noticed that she was selling grocery bags with a quote that would make great thoughtful pinches for a couple of my friends. Again, I feel fortunate that products like these are available and I know that if I didn't go thru an overhaul of what I ate daily, I couldn't appreciate the effort of Ommie. I was sending a grocery bag and five bars to my friend Janet because she is always looking out for my health. The owner of Ommie, Claudia, hand-wrote my sentiments for me on a card before sending the thoughtful pinch. This is the grocery bag with Claudia's quote. I gave this pinch to my friend Emily after I attended her benefit called Heroes for Health. I was grateful that she is a warrior for our children and that she enlightened me with her cause. I attended a Heroes for Health benefit which highlighted the 7 unhealthy ingredients being served in public school lunches. I am a total fan of what this foundation stands for and I think the movement to get these ingredients out of our children's food is admirable. They have a long road ahead of them but trust me, they are making big differences in the lives of many. After the benefit, when we were leaving, they handed us a swag (a.k.a. goodie) bag or (a.k.a thoughtful pinch). I was so impressed! They went above and beyond to give such high quality products in a fantastic re-useable bag. Every item in the bag purposefully enhances the flavor of foods. None of it is processed or contains unhealthy ingredients. Just another example of finding foods that make eating fun. Life doesn't have to be only carrot sticks and veggie burgers. One of the best swag bags I ever received! The bag contained: local honey from my favorite honey company, Italian olive oil, blueberry vinegar, a tea towel and black truffle sea salt. YUM! Speaking of receiving thoughtful pinches, this Christmas my brother and my sister-in-law sent me a wine basket that was packed with lots of yummy treats. Feeling blessed to receive this nice basket of quality items that I have proudly shared with our visiting family members this weekend, I have to share that one item really stood out to me. Well, besides the wine of course. The fig spread. 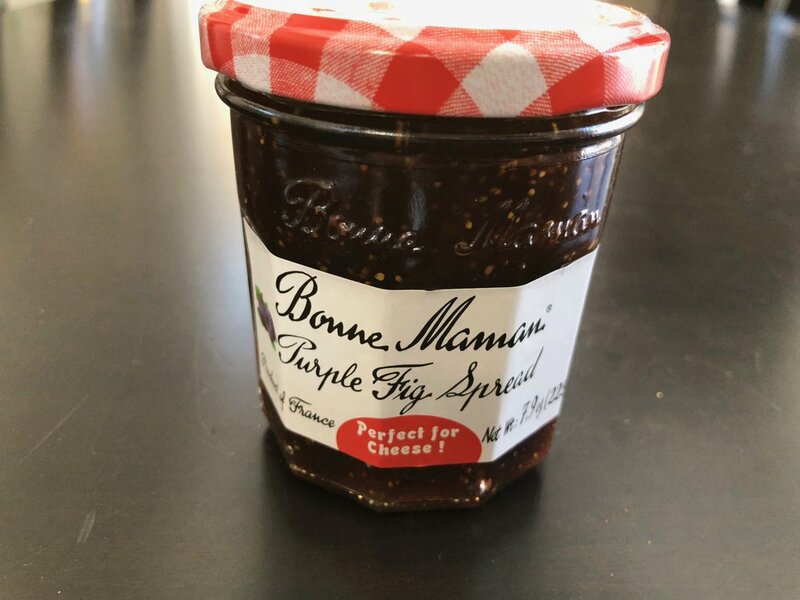 This isn't anything crazy fancy but the idea that this jar of goodness will change the palate when eating a snack of cheese as I sip wine is absolutely dreamy to me. This is a tiny fraction of the abundant thoughtful pinch that my brother and his wife sent me. But don't let the size fool you, it is a powerful food enhancer. Another Xmas thoughtful pinch. 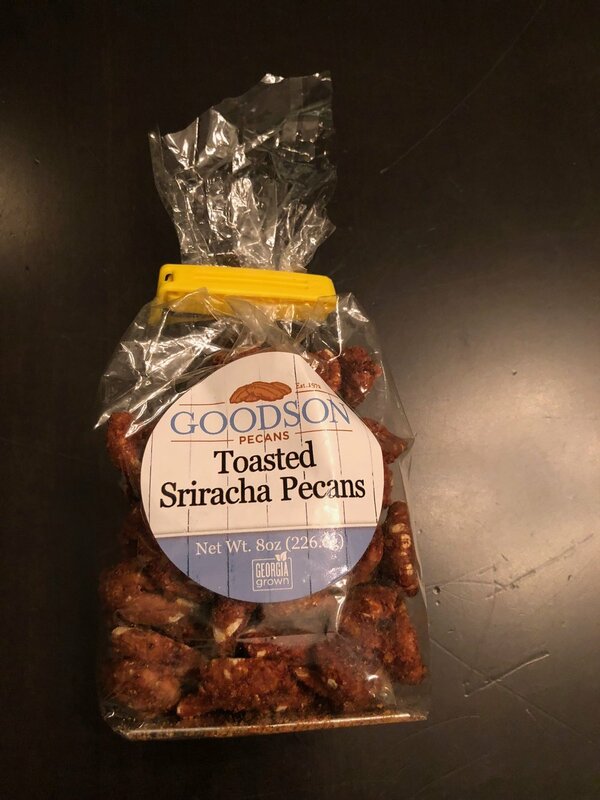 My cousin from GA sent these and y'all these are good! If you're looking for thoughtful pinches to give to someone who is watching what they eat, think about giving non-processed, whole and most of all flavorful snacks. Nuts make a wonderful treat and if you want any recommendations - I've got two names for you - Isadora Nuts and Num Nuts. Two different companies both offer flavors that are crazy good. You don't need a lot of these nuts to feel satisfied and most of all, the flavors remind us that our taste buds don't have to be in jail when we watch what we eat. I like the presentation that both of my friends use to sell their products - they make really wonderful gifts. Especially because most people don't spend that kind of money on themselves for a high quality snack. This pinch would make someone you care about feel like they are worth a million. It's a new year, it's time to find new foods because it's time for a new you. The journey is long but you can always have fun.